Based on the best-selling graphic novel by Joann Sfar, The Rabbi's Cat tells the story of a rabbi and his talking cat, a sharp-tongued feline philosopher brimming with scathing humor and a less than pure love for the rabbi's teenage daughter. Algeria in the 1920s is an intersection of Jewish, Arab and French culture. 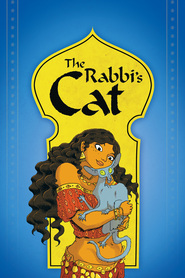 A cat belonging to a widowed rabbi and his beautiful daughter, Zlabya, eats the family parrot and miraculously gains the ability to speak. With the power of speech comes unparalleled sardonic wit as the cat question's faith, tradition and authority in a provocative exploration of God, lust, death, phrenology, religious intolerance, love, and the search for truth. Rich with the colors, textures, flavors and music of Mediterranean Africa, the film embarks on a cross continent adventure from the tiled terraces, fountains, quays and cafes of colonial Algiers to Maghrebi tent camps, dusty trading outposts, and deep blue Saharan nights in search of a lost Ethiopian city.